In the middle of the coldest January most Minnesotans can remember, our family spent the late afternoon and evening at a large indoor amusement park (things that are usually outdoors, like playgrounds and amusement parks, get built indoors in Minnesota so that we can use them for more than two months a year). Since I am pregnant, I did not pay for the wrist band that would let me accompany my family on the rides. I contented myself watching them and reading a good book when the lines were long. At one point, my husband and older son ventured off to go on the scary rides, while I chaperoned my younger son. As it turns out, a grown up can ride for free with a child when that child is not yet tall enough to experience the ride alone. So I went on the carousel with my younger son before he pulled me into the queue for Swiper’s Sweeper. I had been on the ride the year before and remembered it as being fairly harmless. As we waited our turn, my son pointed at the sign advertising the risks for the ride, saying, “Look, mom, no babies.” Indeed, the sign had an image of pregnant woman with a big line through her growing belly. I considered telling my son he would have to wait to go on the ride until we found dad and his big brother, but then I thought of all the times he has to wait or has not gotten to do what he really wants to do because he is the second child. So we went on the ride. He loved it; I spent the whole time trying to brace my body with arms and legs so that my midsection would remain motionless. Fast forward to midnight. I had been in bed for two hours and could not sleep. I was in the middle of an anxiety spiral, sparked by the thought that I had done irreparable harm to the baby growing inside me by going on that one amusement park ride. 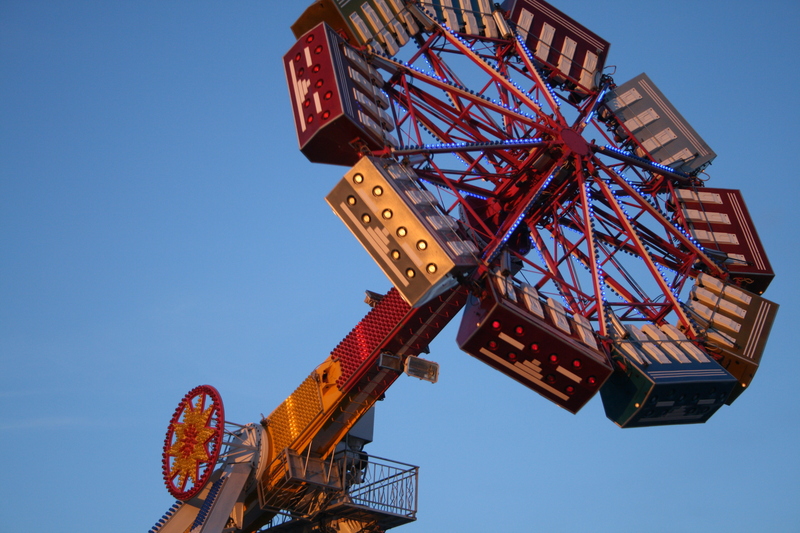 I could not shake an image of the fetus’s neck being broken by the centrifugal force of the ride. Then I started cataloging everything else I had done in the first fourteen weeks of my pregnancy that could have negative repercussions. I had fallen hard on my backside at least a dozen times when we had gone cross country skiing the week before. I had eaten cold roast beef on a handful of occasions simply because I love a good roast beef sandwich. I had not taken my prenatal vitamins and DHA supplement for a number of weeks in the first trimester because my nausea was so bad I could not bear to swallow them. Underneath all of this cataloging was a heap of guilt and shame that I had not always done the absolute best thing for this baby. How could I be so selfish as to eat roast beef? How could I be so careless as to go cross country skiing? Mothers’ anxiety also can trap us in an individualism that allows us to focus on the well-being of our own children while ignoring broader issues that affect the well-being of all children. (This dynamic is similar to what Elizabeth Gandolfo wrote about in her post “D-E-A-D Is A Four Letter Word.) We are so sapped of energy from worrying about our children that we do not have energy left to organize and campaign to insure that all mothers have access to proper nutrition, clean air and water, and adequate prenatal health care. In the end, our anxiety is a force for separation, since it is born from a sense of scarcity and impending danger that drives us to get what we can for ourselves and our families, often at the expense of what others need. So how can mothers break out of the anxiety spiral and its inward focus? There are two things that have tended to help me. First, I try to talk about my anxieties with others. Knowing that I am not the only one who feels guilty for feeling relieved that I have not signed my son up for a spring sport or that I am not the only one who spent an entire pregnancy feeling that I was one bad burrito away from disaster can help loosen anxiety’s hold. When we come together, rather than keeping ourselves apart, we may find out that what was not imaginable alone suddenly becomes possible in cooperation. Second, I try to pray. By invoking a greater power in the universe, prayer reminds me that I am only human and in control of very little that affects my family and me. Far from increasing my anxiety, this frees me to attend to that which I can control and to let go of worry about that which is beyond my influence. This feels like grace. We would love to hear your comments about factors you see contributing to an increase in mothers’ anxiety and what you have done to help loosen anxiety’s hold in your own life. Please don’t hesitate to comment (either here, on Facebook or via Twitter @MotheringMatter). This entry was posted in Nurturing our Spiritual Practices and tagged anxiety, consumerism, grace, prayer, pregnancy.